Indie Folk duo, Gwyneth and Monko are on the menu at Knoxville’s WDVX. They will perform for a live audience as part of the radio station’s daily show Blue Plate Special on November 8th. Knoxville, TN is but one of many stops on Gwyneth and Monko’s tour of the US tour supporting their recently released EP, Good Old Horse. 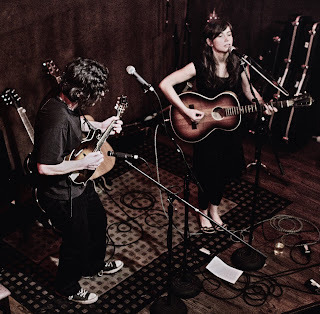 Featuring soulful vocals by Gwyneth with intricate instrumentation by Monko on both electric and acoustic guitars as well as mandolin, this energetic duo blends old timey folk sentiments with modern indie-folk sounds. Laura Meyer will join them. Listen to the show LIVE ONLINE! The WDVX Blue Plate Special is a live performance each weekday at noon. Monday thru Friday at the Knoxville Visitors Center on the corner of Gay Street and Summit Hill Drive in Downtown Knoxville. Past guests include: BR-549, Marty Stuart, and Mary Gauthier, The WDVX Blue Plate Special is broadcast and webcast around the world. Can't make it down for a show? Listen live on-line.